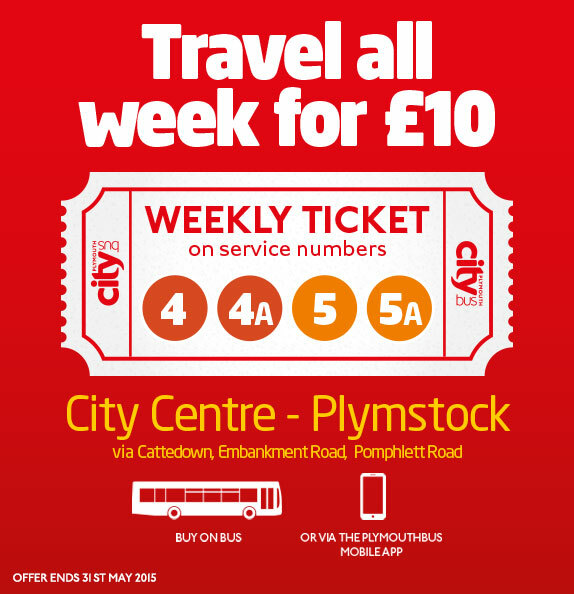 NEW £1 single fares in Mount Batten, Plymstock and Mannamead…. Simply ask for a single within these two points of each of the above routes to pay just £1. And better still as young people aged 5-18 and NUS card holders (any age) pay half the adult fare they will only pay 50p for a single on these sections of the route! 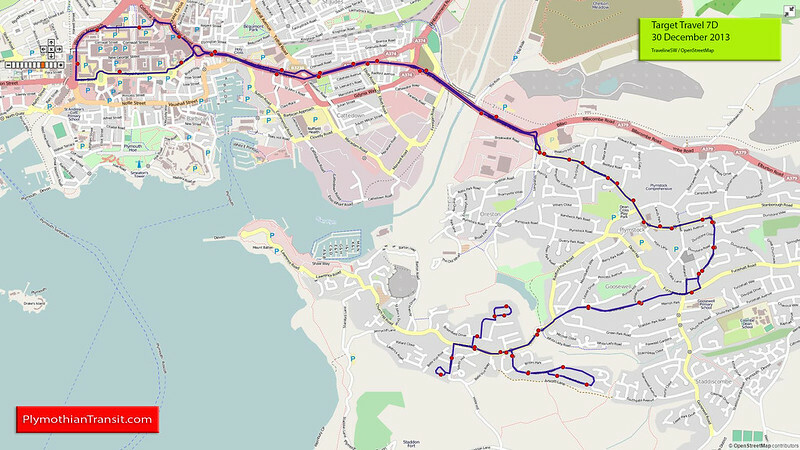 This weekend sees the start of the new increased competition with the new 4 4A, 5 5A routes of Plymouth Citybus up against First 2. Can't see £10 deal working for pcb. It only £11 with First for whom city.. Anyone only travelling within plymstock better off on the 2 fo £1. At least First do proper deals. Yes anon 20:19 09/04/15 Lets hope it is the end of First in Plymouth. For years I have had a dream where I could get a taxi to town cheaper than using a bus, and Go Ahead dear of them are almost bringing that dream alive, then along came nasty old First with £1 fares and the like and destroyed it all... please give Go Ahead the monopoly so they can put fares up even more, I can't wait. So First cut fares encouraging people to leave their cars at home and catch the bus, exactly what they are supposed to be doing and this wrong..how? for years I have driven into town because I find it cheaper than paying Citybus, since the fares drops I leave my car at home and use First, this saves me money, relieves congestion and is better for the envioronment so good result all round, is this not what public transport should be all about? Also Citybus normally end up cutting their fares to follow First once they start losing customers so would they not be loosing money too, only they have way bigger overheads and shiny new buses to pay for! Perhaps too you should think about those working at First before shouting this nonsense, I hope for their sake they take no notice of such rubbish comments. I completely disagree with anon 20:19 09/04/15, if First was to give up on Plymouth, then their prices would rocket, the newer buses might even be placed elsewhere and older buses transferred down to Plymouth, healthy competition is good for everyone, prices are lower and more competitive, frequencies are more spread and more options to chose from! Competition Health?? My backside. Competition is one of the reasons Western Greyhound went down the pan. It just makes things more difficult for bus companies who are trying to improve the quality of service because they can't make money. Why do you think Citybus bought the new vehicles, its nothing to do with First, its because that's what people want. Anon at 20:59 - slight flaw in your arguement: if there wasn't an open market in the bus industry then Western Greyhound wouldn't have existed in the first place. Secondly, I know why Citybus bought new vehicles, like all sensible businesses they have a rolling programme of asset replacement. And First do likewise, even if the new assets aren't delivered to the depots where some might like to see them. At a business level the buses are simply tools which help the company make money, and making money is the only reason the company exisits. New rolling stock hopefully (and I know this often isn't the case, as many in the industry will testify) need less repairs, will spend less time off the road and after years going in the wrong direction, hopefully new buses will now give better fuel consumption figures. Sure, a sensible busines will let the marketing team in on the process and the new tools will have some fancy gadgets, a flashy (pun intended) livery and so on, but ultimately new buses are no different to a shop having a refit, the local factory replacing its widget making machine with the latest model, or the self-emplyed builder buying a new cement mixer. To be honest I don't know why people are so 'fussy' with citybus, there buses are relatively modern, clean with some having free-wifi or tv scrrens. For actual Plymouth the weekly ticket is only £16, in comparison to Stagecoach's Exeter services which are £14 that's not bad. People are fussy with Citybus because of who owns them. Take a trip to Salisbury or the Isle of Wight to see the levels of service they get away with, at higher fares than in areas where they compete for their market. Councils subsidise peripheral services because there is a monopoly yet Go Ahead is happy to operate peripheral services commercially when competition is present on the same corridors. In some areas the market can stand two operators. Greedy old Go Ahead won't allow that to happen. They want the monopoly so they can clear up the market and enrich themselves. Same can be applied to Stagecoach in Devon, the councils are stupid to be cutting tendered work done by the smaller operators because it will see them out of business, thus meaning the big outfits can charge what they please to the taxpayer as there is no competition. In this context you can begin to see and have sympathy with the calls to renationalise the whole lot so that services work for the taxpayers and the staff not just the shareholders own interests. Obviously this is a bit hard to explain to the average enthusiast and brainwashed fan who are blind because they don't wish to see. I think you will find that fares on the Isle of Wight have always been expensive, even in the days of the Tilling Group. So possibly not the best example to use in making your case. You might be right there, but they are still profiting excessively due to the monopoly they've enjoyed because they're the one provider on the Island. Difference being now that a private business benefits from the profit, as opposed to the taxpayer. Then there's the 'More' bus network in Bournemouth, relatively good service there, modern vehicles, USB plugs & free Wi-Fi quite a lot to complain about isn't it ;) Lets face it, people see big national brands and think 'greedy' when actually its nothing like that. Then there's the people who want to renationalise the buses & the railways, the stupid fools, it would cost more, leave older buses etc. Half the problem is this 'competition commission' at lot of the reason independent like Western greyhound went is because of them. "Take a trip to Salisbury or the Isle of Wight to see the levels of service they get away with, at higher fares than in areas where they compete for their market." I don't know where you've been - the service offered by Southern Vectis is amazing. Where else do you get commercial night trips in rural areas, for example? Yes, fares are high, but it's not true to say fares are high and the service is poor. What a patronising and disparaging comment from Anon 18:19. All operators charge (to be blunt) what they can get away with, depending on circumstances whilst balancing maintaining revenue against optimum passenger numbers but that's no different to other businesses in any other industry. First, Stagecoach and Arriva are no different. Go to Brighton and see how successful and innovative Go-Ahead have been over the years.... and don't get hung-up on prices of single fares, it's the value of day/week/monthly/yearly tickets that is important to most companies - that's where their interest quite rightly is. Revenue from single fares is a bonus, it's the icing, not the cake. Renationalisation is not the answer, it would be horrendously expensive to fund and services would run when and where the council/LA/whoever was in charge thinks they should rather than in the passengers interest. The lucrative cash cow services would be slashed and resources moved elsewhere (where there is less or little demand) because of councils' whims and their own pet projects. Passenger numbers on the core, busy services would tumble, it would be a disaster. Profit is not a dirty word, it's the key to the whole thing - no profit means no investment in new buses, garage equipment or anything else that helps bus services to run smoothly. The same would apply if the buses were nationalised, except even without profit, the investment would still happen - the difference is who would pay? yep, that’ll be you and me, the taxpayer. I know which set-up I'd prefer. I am actually in favour of competition, it means operators work harder for their customers. I am against a private monopoly and the excesses that go with it. I have seen what monopolies in the bus industry do to the customer and I've seen what competition does for the customer. I live in an area where there is competition, I get a better standard of bus service because of that. I have lived in areas where the operator enjoys a monopoly, and that service has been terrible. The customer has a better service where competition exists. It's the same when I go into a supermarket and choose from many different products for my shopping, or from a choice of supermarkets. If they don't provide the best quality goods at the best price than I look elsewhere. What should happen in situations where the operator has no reason to provide a better service because they have a monopoly? 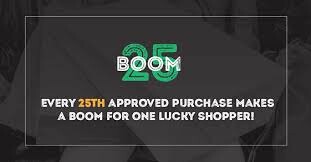 Who benefits? The customer doesn't because they don't have an alternative, they might have a car, or the train, but if not, they're tied into a poor quality bus service. And I have seen numerous examples of council's held to ransom by a monopoly operator threatening to withdraw a service unless the council pays them subsidy. I have seen it go on. I have seen numerous examples where competitors appear in the market and the big company uses its position to freeze out the competitor, knowing that it has the bigger pockets and after that is done, cut the frequencies and increase fares. Politicians of many shades are asking these same questions of the industry. Trotting out the hackneyed cliche's about regulation being terrible and the same old 'success stories' just doesn't cut it anymore. They are asking why public money props up private enterprise and why does that money not deliver better bus services for all. They look at the 'success stories' and ask why not here, why can't we have this too? Some ask why do you run buses in London and are prepared to run in a regulated area, yet object to it being done elsewhere where you enjoy the monopoly. Like you I work and I pay tax. What is done with my tax money and why is it subsidising a private bus company to provide a bus service? Why isn't that operator providing the service commercially? They would be prepared to provide that service instead of losing it to a competitor. In Plymouth you have five operators in the market, offering different levels of price and quality on their products. I think competition is encouraging innovation with the operators thinking harder about their product. Some of these operators would like a monopoly and enjoy it elsewhere. They provide a lesser standard of service. if i recall first had to sell off parts of their business to raise 100 million, whereas go ahead are on track to make 100 million profit, without selling the family silver! By being the most expensive form of bus travel going.. as was previously stated. GREEDY. That's because First went massively wrong under Moir Lockhead. So are the 4 and 5 group of services really running left-hand drive buses now? Why on earth can't marketing people use sensible imagary? And was does management sign-off such rubbish? Anyone got any ideas what passenger numbers were like on the 2 and 4 ? Have citybus done well first week or is it mainly First holding on? Also ditto on 76 and whatever citybus route is? Considering that First on the 76 only have 3 out bound and 2 in bound services operating North of Callington Monday to Friday and then only on school days and they don't go North of Callington at all on Saturdays, the traveling public living North of Callington will probably see Go Cornwall as having 'done quite well' in bothering to provide them with a service. There is no reason to suspect that their service 12 (not a difficult route number to remember) is any less well used than the previous 576. Well they have been running a lot of double deckers on the 12. Often with no more than 2 people on at a time. The usual busy buses, the ones the workers and college students use are as busy as normal. Apart from that, the would have lost money on every journey. On a day when they may have needed double deckers, the placed the old Greyhound solos on 12 today. Along with the 13 year old Brighton and hove cast offs. Solo on the 12 last night (a tendered journey, I believe) showing no destination and a paper '12' in the windscreen. Loadings are not going to be high between Callington and Plymouth as three buses an hour is way over what is needed. The only way to increase loadings is to attract people out of cars - WG did that on their 576 by avoiding Fore Street in Saltash and thus offering a fast journey right into the city centre. On the Torpoint Ferry the other day going towards Devonport - First short Dart with one passenger and Citybus d/d with a healthy load (I would guess about 25). This was at 5 in the evening so against the rush-hour flow. Western Greyhound solos are 59 reg so there not really that old. Neither are the Brighton Tridents there about the same age as the rest of the second hand fleet(and a lot younger than the First fleet) Sometimes there is positioning movements, such as running a double decker empty on a 2pm run, coming back at 3pm with a load of school kids on-board. Blimey, do you all think because they have increased frequency everyone is gonna stop using there cars and Gill up the extra buses?? It takes time for new people to start using them. If Citybus are only carrying 2 passengers then that's 2 more then first! They've been running empty buses for a couple of years now. And the reason deckers are on there is at least one of them anyway is the school working from launceston, this driver now does 12's instead of 36's during the school trips..
Also people often slate the ex Brighton and hove buses but they were well maintained and the majority are still reliable, look at the state of first buses, filthy (is a understatement), excessive exhaust emissions, stepped entrances . . . . I'd rather stick with professional Citybus. Anon 19/04. 12:53 First only charge £11 now for weekly ticket for whole of Plymouth, Plymstock, Saltash and Torpoint.. It's been that price for since 2013. Citybus £10 fare is a promo til end of May only don't forget. Go to the B&H website and click the names (they're links to the people involved). As these buses will soon be removed from the current page, you might need to go to the 2002 page instead (link near the top of the fleetlist). You are living in a fantasy world. WG went out of business because they lost tenders to other INDEPENDENT operators, then registered them commercially, they failed to stitch up the Cornwall Council tenders at last, First's bid for the Truro Park and Ride was cheaper than WG's greedy price, because they lost control of the day to day basics of running a bus operation, and because one man thought he knew better than everyone else. WG's demise was b****r all to do with competition.